This entry was posted on Tuesday, December 4th, 2018 at 10:59 am. A WESTBURY couple, Keri and Pam George, have celebrated their diamond wedding anniversary – 60 years of marriage. The couple met in 1955 at the library in their hometown of Tonypandy in South Wales, which was originally a dance hall. Three years later, on the 29th November 1958, they were married. They decided to move to Westbury in 1967 where they have lived ever since. Keri and Pam have four children: Robert, Jayne, Philip and Clare; 9 grandchildren and 6 great-grandchildren. When asked what their most memorable moment has been, the couple told of their appearance on ‘Beat the Clock’, hosted by Bruce Forsyth, whilst on their honeymoon. They were the lucky winners of a TV and were the talk of their street, being the only people to own their own television. But, they added, Bruce Forsyth wasn’t very nice! The couple say that their secret to a happy marriage is their family. They say they were the best thing to happen to them, and the secret to a happy life. Keri and Pam also said that they both love each other even more now than the day they got married. 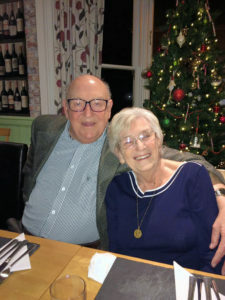 The couple celebrated their diamond anniversary surrounded by their family with a meal at The Hollies in Westbury Leigh.